With the world’s fossil fuel resources rapidly depleting, and human-caused climate change becoming an increasingly pressing threat, there is a dire need for sustainable alternatives to oil and natural gas. One such alternative is the use of liquid biofuel–fuel that is derived from organic matter. Traditional biofuels like ethanol are typically produced from food crops, such as corn or sugar. However, this method often has a negative impact on food prices and availability, a pressing problem in today’s world. Furthermore, the production of corn and soy require arable land and freshwater–which are limited in supply. Instead, researchers are investigating how lipid-producing microalgae can be grown and harvested in order to produce an alternative form of biofuels. Microalgae biofuels provide a more environmentally sustainable and efficient alternative to other crop-based biofuels. Microalgae are more efficient and can be grown on non-arable land. Chlamydomonas reinhardtii, or Chlamy, is one type of microalgae that is commonly used in biofuel production research. With the vast amount of research conducted on Chlamy, including its sequenced genome, Chlamy is a model organism for microalgae. Microalgae biofuel production is currently constrained by the fact that there is a negative correlation between lipid and biomass production. The lipid primarily produced by Chlamy is triacylglycerol, the same fatty acid which are used to produce biodiesel. Chlamy’s biomass also has a variety of applicable uses, from the pharmaceutical industry to fish feed. For this reason, we are examining the impact of a multitude of growth factors on Chlamy in order to develop a systems model of its lipid and biomass production. This model can be later used to ensure that Chlamy is grown under optimal conditions for maximum lipid and biomass output. Researchers have found that Chlamy is capable of growing through photoautotrophic (using only light and CO2), heterotrophic (growing on only an organic carbon source) and mixotrophic growth (using both light, CO2, and an organic carbon source). Under stressed conditions, Chlamy produces lipids, yet it will stop growing. Thus, there needs to be a middle ground to maximize population and oil yield. As part of our ISB internship, we examined how Chlamy’s growth was affected by the manipulation of CO2 and light. We also identified the difference of biomass growth through photoautotrophic and mixotrophic growth. By analyzing the effect of these factors on Chlamy’s growth, lipid production, pH, and cell density; we hope to discover the best conditions for maximum lipid and biomass yield. In addition, researching the effect of CO2 on Chlamy will give ISB additional insight into how Chlamy would fare in the face of global climate change or similar environments in which CO2 levels are drastically increased. Out of all the trials for both experiments the results clearly show that high carbon with medium light under mixotrophic conditions is the best option in maximizing Chlamydomonas reinhardtii populations. 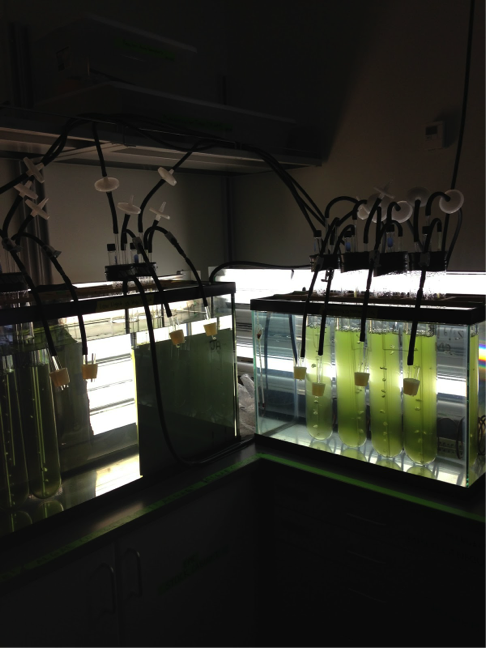 Under these conditions, microalgae biofuels can provide a higher biomass yield than before. By understanding the population growth of the microalgae, researchers can become more efficient in growing microalgae for biofuel; therefore, increasing the possibility of microalgae being a viable long term resource for the rising population of tomorrow. For comprehensive information about our experiment, please see our attached lab reports.